There are two types of agriculture, seasonal industries and not. Wheat is an annual crop that is reliant on the seasons for seeding, growing, harvesting, etc. On the other hand, in Mexico, avocados are a perennial crop that produce year-round thanks to the light winter season so that the trees don’t go into a long cold acclimation process. Curious? Read more.This is important to consider when thinking about how your own industry works. Throughout the year do you notice patterns from customers and clients? Do you have products that tend to sell better in summer? Do you participate in Black Friday sales? How often do you tend to launch sales, and are there patterns with that? Whether you are new to business or your industry, the best thing you can do is begin looking for your industry’s conferences. Typically, Industry conferences will be during the slow times. For example, concrete machinery expos will happen during January-February when most of the country can’t pour concrete. Cation: Take time to evaluate whether this conference or expo is right for you. Some conferences are just people pitching products. Be sure to search for the real thought leaders for your industry and where they go to present. Some might even have regional conferences that are easier to attend than national conferences. These are also good opportunities to sit on a plane for a few hours and really evaluate how your business is doing. What are things you would like to change? Make sure you are primed with data, a journal for your thoughts, ambition, and the desire to make a difference. Online statistics can be your best-friend in evaluating what your seasonal industry trends might be. Of course, being a Digital Marketing company, we believe all online data is good data to have on hand. Example A: You run a landscaping company. You have a lot of one-time visitors to your website that spend an average of 35 seconds on it. Well, if the goal on the web page is to have them fill out a contact form, the KPIs would be the amount of website visitors and how many people filled out the form. The average site time is not as important since some people might be very slow at typing on a keyboard or very quick. That statistic is not as relevant to your bottom-line as much as site visits and conversions are. These KPIs contribute to your bottom-line in terms of sales and revenue. Example B: You are running a software company that has all kinds of documentation available. In terms of customer life cycle you may want a much higher time spent on site so that the people buying your product are being trained on how to use it. Once they know how to use the product they might be 80% more likely to be a long-term customer. Therefore, the time spent on site is a KPI. These types of KPIs need to be evaluated and set for your business. We recommend setting up live dashboards to help you daily monitor KPI and make sure your goals are right in front of you. For seasonal businesses you will notice your site traffic fluctuate in some months. That can be a great indicator. 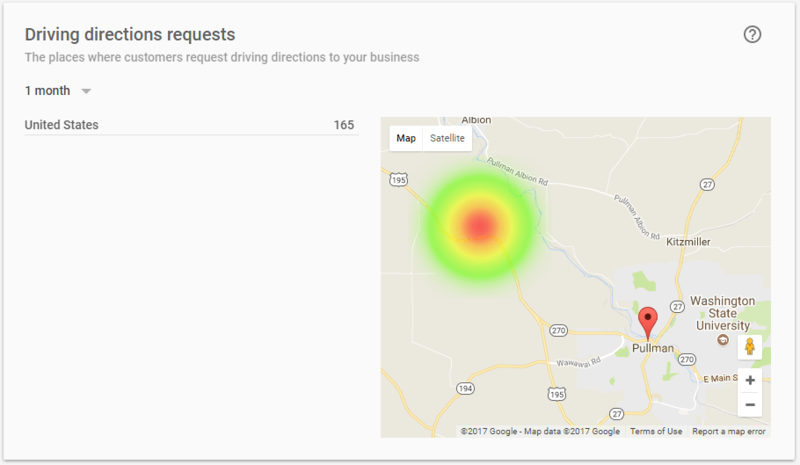 Your Google Local Profile can be “key” in this type of evaluation as well. Or where are people asking for the directions from? Where are your customers coming from in the first place? Of course, sales. For example, if your business sells weather attire, are you selling more rain ponchos during the fall months, or snow shoes during the winter months? There’s a good reason a grocery store or gas station would choose to sell rain ponchos: because they’re high profit margin items with a low storage footprint. Even though they are very seasonal, if it rains for a week while someone is buying groceries, odds are those ponchos are going to be purchased because they are in demand. A rain poncho from a supplier may run at $0.25/each but you can sell them for $4-$5 (very high profit margin). Inversely, a product like chewing gum is a mid-margin item with a higher storage footprint because it is consistently going to be purchased throughout the year. How to evaluate the above in non-seasonal industries? The first thing to evaluate is when you can take a break. If you feel like you can never take a break, you might be needing to delegate, set boundaries, or evaluate how to run your business with greater efficiency. Ideally, you want to be a business owner, not always a business operator. Without being able to take a break, you are not allowing yourself the opportunity to improve your business and create stronger revenues. Most of the above steps still can apply to you, but finding the time is the biggest concern. One of the best things you can do, we mentioned it above, is to look at going to conferences and expos for your industry. This will help find a potential slow period for you to maximize on. The other side of it is to evaluate holistically your customer life cycle and see if there is a spot in the life-cycle that has the highest profit margins and revenue. Once you identify that, try to see if there is a way you can maximize those high profit margin periods within your customer life cycle. Although business might be constant, that life-cycle can create a seasonality to every business.